Social video experts Be On review the latest viral from Starbucks. With all sorts of technological wonders on hand, communication has never been so easy. At least that’s what we think. But can technology really replace the one-to-one moments? Starbucks certainly doesn’t think so. The coffee company is an obvious defender of chats over a hot beverage, preferably in its stores, but disconnecting from our devices and reconnecting with our friends and families face-to-face is not a bad proposal. 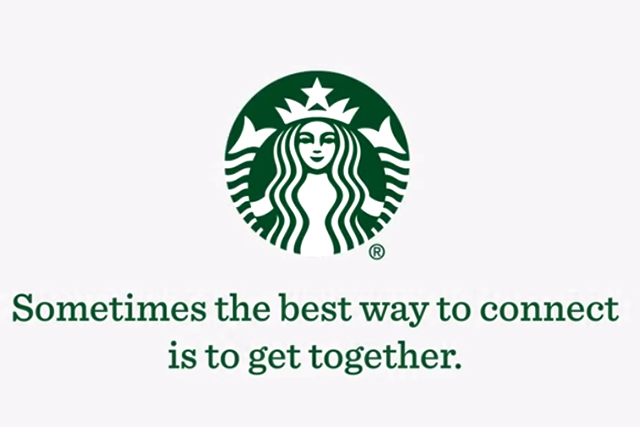 Starbucks released three pieces of video content to promote the campaign, which uses the tagline 'Sometimes the best way to connect is to get together'. The message is simple and agreeable; in a world dominated by technology it’s easy to relate to this story. The brand presents us with three different scenarios: a dad comforting his daughter, two girls discussing a recent date and banter between a couple. In the same style as its predecessors, the final video starts with short text messages that pop up on a mobile phone screen, while the same conversation can be heard in the background. As the conversation develops, it soon becomes clear that such intimate moments should really take place face-to-face. Starbucks is onto something, however there is room for improvement when it comes to the delivery. As familiar as the conversations may be, they come across as staged. Yes, the idea is simple and effective but it lacks originality and realism. Of course, reusing a concept is not a condemned practice but relies on great execution and constantly bettering previous attempts. The overall campaign is an interesting project with potential if execution is improved. However, in its current state, this piece of content won't reach large social numbers.